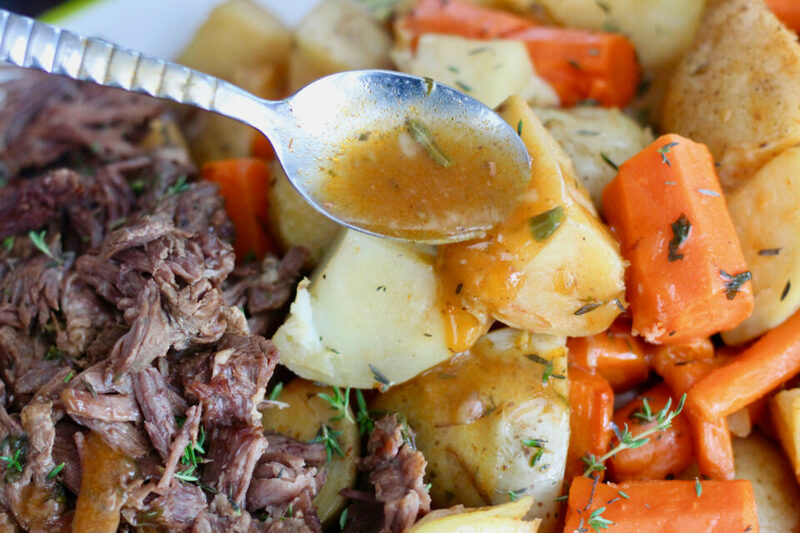 This incredibly tender pot roast dinner comes together in a flash by using the pressure cooker! It’s the perfect dish to feed a crowd and requires minimal clean-up! We consider that a win-win, don’t you? 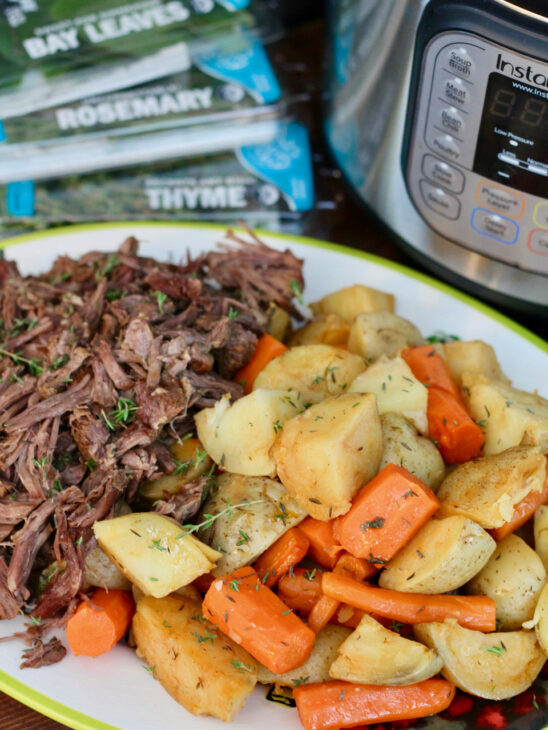 We are big fans of one pot cooking, and this pot roast recipe takes comfort food to a whole new level of awesome. Like seriously… swoon. 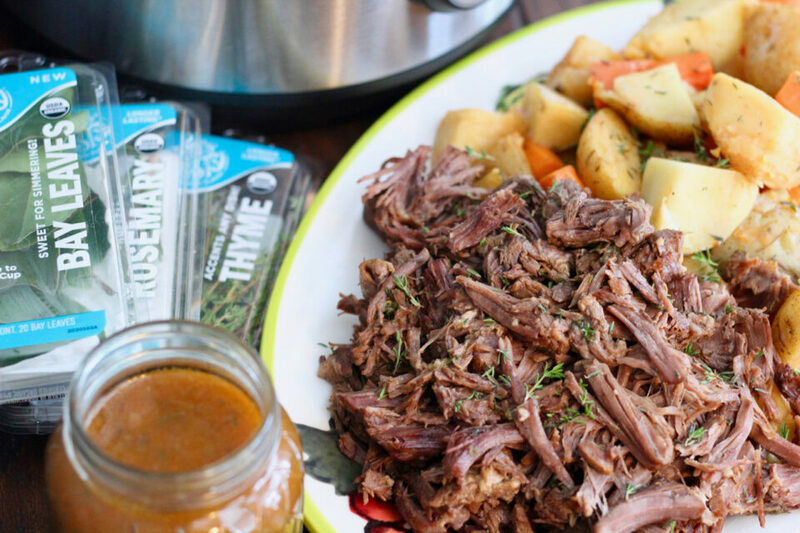 Instead of roasting the meat for hours and hours, an Instant Pot magically cooks the same juicy masterpiece in just over an hour. In a small bowl, stir together seasoning spices until combined. Rub mixture all over the roast. Turn your instant pot to “sauté”. Wait until the front reads “HOT” and then add oil and sear roast on all sides. About 3 minutes per side. This is not a mandatory step, but it sure adds a heap of flavor. We don’t want to sound bossy… but do this. You won’t regret it. Add herbs, broth, tomato paste, Worcestershire sauce and balsamic vinegar to the pot. Then switch the instant pot mode to “pressure cook” on high for 60 minutes. Make sure that the valve is set to the sealed position. After the cook time is complete, turn valve to vent for roughly five minutes (or until the pressure button drops). Carefully open the instant pot and add potatoes and carrots. Place the lid back on and turn the valve back to sealing. Set to “pressure cook” mode for 3 minutes. When cook time is complete, switch the valve to vent and allow steam to release for roughly five minutes (or until the pressure button drops). Remove potatoes and carrots from the pot and set on a serving tray. Also remove the rosemary sprig and bay leaves and discard. Take out the roast and pull apart, as desired. Arrange side-by-side next to the potatoes and carrots on the serving tray. Combine equal parts of corn starch and water in a small dish. Set the instant pot back to “sauté” and bring to a boil. Whisk cornstarch into the remaining juices in the instant pot. Turn the instant pot off and continue to whisk for 2 minutes, or until thickened. Serve with pot roast and enjoy! 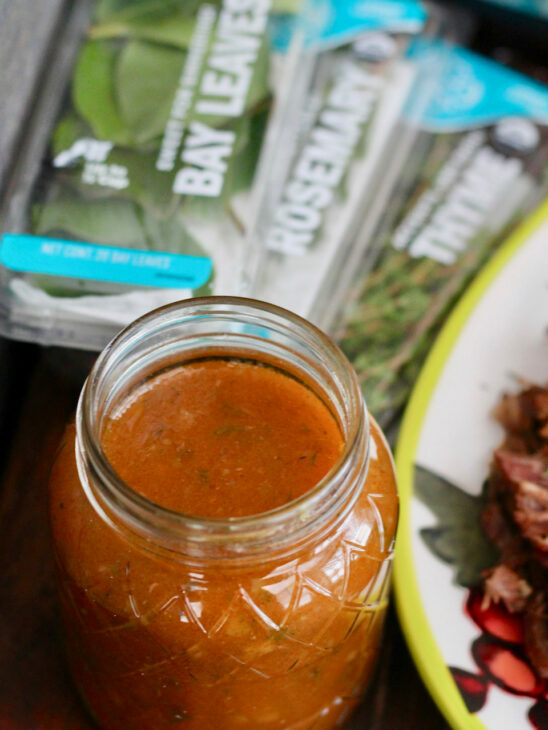 Our fresh herbs infuse the cooking liquid into a flavorsome gravy. It’s one of our favorite parts about this recipe! This last step isn’t required, per say, but the meat and potatoes taste pretty darn good with a drizzle of this liquid gold.